Margaret Knight was fascinated by machinery; she eventually settled on inventing as a full-time profession. Inventing was an unusual choice of career for a woman in the 19th century, and Knight's gender would complicate her efforts to receive credit for her most important invention, a machine that made flat-bottomed paper bags. However, she became a symbol for the early women's movement, and her invention changed the way people shopped. Margaret Knight was born in York, Maine, in 1838. Her father died when she was young, and her family was very poor. After her father's death, Knight and her family moved to Manchester, New Hampshire, where work was available at the many mills that manufactured cotton fabric. 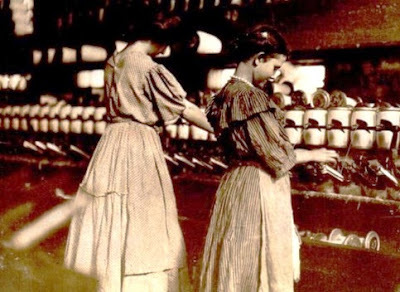 At that time, cotton mills commonly hired children as workers, and Knight and her siblings cut their formal education short to take work in the mills. When she was 12 years old, Knight witnessed a mill accident caused by a steel-tipped shuttle shooting out of a mechanical loom. The shuttles, which carried thread, were used to weave fabric and were thrown through the cross threads by a mechanism in the loom. Occasionally the thread tied to the shuttle would snap, and the shuttle, no longer tethered to the loom, would fly out of the loom at great speed. The shuttles had sharp metal points, and in the accident Knight witnessed, a shuttle flew out and stabbed a mill worker, causing a serious injury. Knight decided to develop something to prevent such accidents. Within a few weeks, she had invented a safety device that came to be widely adopted by the Manchester mills. Knight never patented the invention, and its exact nature remains a mystery to historians. Contemporary accounts suggest either that it was a guard to physically prevent the shuttle from flying off the loom or that it was a mechanism to automatically stop the loom if the shuttle thread broke. Knight developed health problems that prevented her from continuing work in the cotton mills, and she spent her teens and early 20s moving from job to job. She worked in engraving, home repair, and photography, among other jobs. In 1867, she moved to Springfield, Massachusetts, where she took a job with the Columbia Paper Bag Company. At the time, paper bags were not the ubiquitous disposable carrying sacks they are today. Machines could make paper bags by forming a tube out of paper and pasting the bottom and side edges together, but the result was a very narrow bag, much like a large envelope, that could not hold anything bulky. (This kind of bag is still used in stationery and card stores.) Flat-bottomed paper bags could hold more, but they had to be made by hand, and so they were too expen-sive for most uses. When going shopping, people usually brought their own cloth sacks or were given their purchases in crates or boxes, which were bulky and difficult to store. The Columbia factory used machines to make the narrow kind of paper bag; but the workers made the flat-bottomed kind by hand. Knight found her job boring, and she soon became interested in the problem of designing a machine that could make a flat-bottomed paper bag. Knight spent a good deal of time at work watching how flat-bottomed bags were made and trying to figure out how to duplicate the process with a machine, which would have to roll and glue the paper into a tube, then cut, fold, and paste the bottom into a square. She spent so much time at work studying the problem that her employer complained about her wasting time. Once Knight told him what she was trying to do, he decided to support her efforts. After a couple of years, Knight had a working machine that made flat-bottomed paper bags. She applied for a patent, only to discover that a man named Charles Annan had taken out a patent already for a machine Knight found suspiciously similar to her own. Knight discovered that Annan had spent a lot of time in a machinist's shop where she was having a model of her device made, and she decided that he must have copied her design. She took Annan to court in 1870 and won her case (see box, The Patent Battle). Annan was not the only person to recognize the value of Knight's invention. Knight fielded a number of business offers, eventually enter-ing into a partnership with a businessman from Newton, Massachusetts, with whom she founded the Eastern Paper Bag Company of Hartford, Connecticut. Knight had no interest in running a business, however; under the agreement, she took no management role at Eastern. Instead, she was simply paid cash and company stock for the use of her patent. Knight's machine lived up to expectations, and soon cheap flat-bottomed paper bags were widely available. Her invention changed shopping in the United States and abroad. In 1871 Knight was decorated by Great Britain's Queen Victoria for her invention. Following the deal with Eastern, Knight became a full-time inven-tor, living first in Ashland and then Framingham, Massachusetts, and working out of an office in downtown Boston. The Eastern deal set a pattern that Knight would follow through the rest of her career, selling her inventions to companies so that she could live off patent sales and royalty payments. Knight took out several more patents for paper-hag machines. In the 1880s and 1890s, she also moved into shoe manufacturing, developing new sole-cutting machines. Toward the end of her life, Knight became interested in rotary engines, then a relatively new technology, and she received several engine-related patents. Knight eventually held 30 patents; she also invented many devices that she did not patent. An article published in the New York 'Times in 1913, a year before her death in Framingham, noted that the elderly Knight was "working twenty hours a day on her eighty-ninth invention."